Microphone in hand, a dozen of the Williamson County School Board candidates made their case for why they should receive one of the seven seats up for grabs. 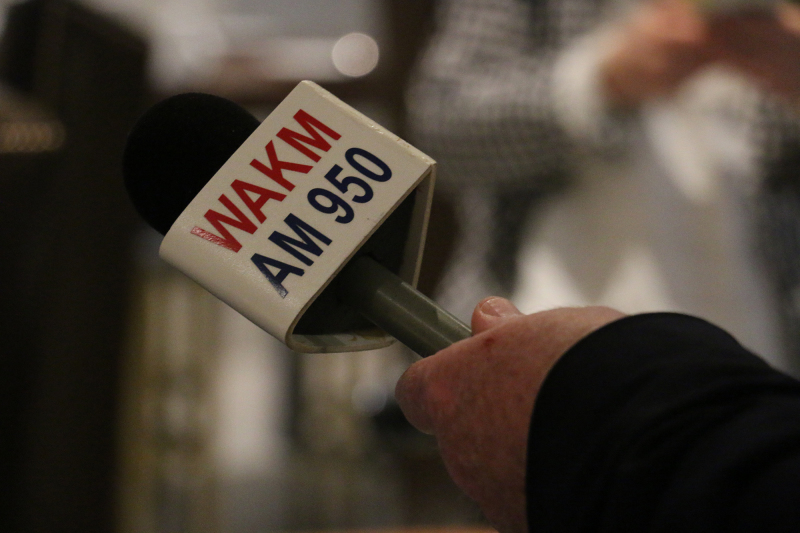 During the Williamson Herald and WAKM 950 coffee and conversation on Tuesday morning, candidates reflected on their platforms, rezoning and best education practices. They also explained what made them better than their opposition. Current chairman and District Five’s incumbent Gary Anderson wasn’t able to attend because of a work conflict along with District Nine’s Denise Boothby who had a prior commitment. Neither District Seven’s Jennifer Luteran or Christopher Richards attended, or District Four’s Joey Czarneski. Throughout his election, both of the District One candidates have had a fairly quiet race, not slamming the other on social media and actively participating in candidate forums. Richard Davis, who currently works for the county, lives in Leiper’s Fork. He said he ran for the school board provide the best education possible for Williamson students, noting that every child should have equal opportunities. He said it troubled him at first when he realized Fairview High School only offered Spanish as a foreign language in comparison to other schools across the district. That alone is something he would like to work on if elected, along with improving the county’s bus route system. He said he just received his son’s bus route schedule, where it will take him an hour to get to school. Angela Durham is a Fairview mom, who works full time at AMSURG. She’s served at her kids’ schools through the PTO, and said if elected she would like to become a parental advocate. Durham explained she sees the opportunity to partner more with the business community and the school system. She also noted that constituents have voiced concerns to her over district transparency and prepare special-needs students more before they reach graduation. She said her experience in the business community could become advantageous if she were elected onto the school board. She added she would look forward to working with Superintendent Mike Looney, while giving him an outlet of trust but also holding him accountable. At the end of early voting, only 704 residents had cast a ballot, totaling 6.7 percent of the 10,385 registered. While District Three has plenty of options with candidates campaigning hard, early turnout results have yet to prove how enthusiastic Spring Hill residents are school board. Only 563 votes came in, totaling to 5.1 percent of the 10,998 registered. On multiple forms of social media, the candidates have collectively pushed the vote, and hoped one more appearance before Thursday would help. This morning, all three participated, explaining why they would be better than their opposition. Spring Hill mom and tech specialist Christy Coleman said she wanted to run for the open seat after coming to school board meetings for the past few years, an advantage that she thinks will benefit her if elected. Kim Little just had her last two of five graduate from Williamson County Schools. She explained her campaign was all about retaining educators that make a difference in a child’s life. She said her conservatism, endorsements and passion for kids made her the viable candidate. Former Spring Hill alderman Eliot Mitchell said his experience serving on the Board of Mayor and Alderman for 12 years gives him a perspective that neither of the other candidates have. He also listed through his community involvement and volunteerism, noting he’s always cared about his community and remaining plugged in. Incumbent Anne McGraw said she thinks consistency and experience makes her the best fit to keep the District Four seat. She said her desire to run was simple and stemmed from her two daughters, who were strong little girls with enormous dreams. She said nothing involving politics had anything to do it with, and she doesn’t consider herself a politician. Though, she noted she had become frustrated with some of the distractions the board faced in last couple of years. Joey Czarneski said he wants to ensure smooth growth and propel Williamson County Schools forward if elected to the unexpired District Four school board seat. I will work hard to keep communities together and limit splinter feeders in the upcoming rezoning, which puts students first. I lived in the Fourth District during the last rezoning and understand the concerns that communities have about upcoming changes. I will work with everyone on the board to develop long term solutions for our continued growth so that we can limit rezoning in the future. I value our high quality teachers who always put students first My wife has been a teacher in Williamson County for 18 years and my son is a rising sixth grader in Williamson County. I understand our teachers are one of the most important assets toward high quality education. So far, 680 people voted in District Four, totaling 5.2 percent of the 13,023 registered. Mother of five, Nolensville mom Julie Mauck said she ran for the district to offer a new perspective. While she noted Anderson’s service and said she appreciated what he had done for the system, she said she felt the need for more community dialogue and input. She said she would like to see more options for parents to have a say in what’s in the classroom, along with the board pushing back against the state and federal government mandates. Gary Anderson has served on the school board longer than any current member, serving for the past quarter of a century. The Nolensville man spends all day surrounded by education, with his full time job as Assistant Superintendent of Schools for Murfreesboro City Schools. I have over 25 years experience as a WCS board member. Because of that, I have experienced all the state and federally mandated changes in education and dealt with multiple rezoning efforts due to our explosive growth and the opening of new schools. I am experienced in school board operations and leadership since I have been the chair of the board 7 times and unanimously elected by my fellow board members to be chairman this past year. My full time job is Assistant Superintendent of Schools for another district which keeps me totally engaged with education issues from an administrative side as well as a board member side. This gives me a very broad perspective of school district management, operations and oversight. So far, 888 Nolensville residents have voted, totaling 6.7 percent of the 13,075 registered. Out of three running, incumbent Bobby Hullet was the sole candidate to show up for the on-air conversation. His district had seen the second-highest voter participation with 1,374 votes, totaling 10 percent of the 12,931 registered. Hullett has lived in Williamson County for decades and works for Vanderbilt Medical Center as a senior information technology consultant. He has two sons who attend Williamson County Schools. He said while his opponents have criticized him for “rubber stamping” any initiative from the superintendent, Hullett said he had a rebuttal for that. He explained he ran again for the school board maintain the system’s growth and looking ahead into rezoning efforts. Jennifer Luteran is full-time mom, who once worked as a lawyer. Two of her children attend Edmondson Elementary School, and the other attends Brentwood Middle School. She has stayed involved with the PTO at both schools. Luteran was not in attendance because of a prior family event scheduled, but provided a statement, which was read on air. Here’s a portion of what she shared. My campaign is about offering new solutions. If elected, I intend to further enhance partnerships between the schools and the business community. I would like to see the businesses have a more active partnership with our schools so that our children will benefit from more internships, scholarships, motivational speakers, college ready classes and teacher assistance. As a school board member, I want to bring about more transparency in how we spend taxpayers’ money, operate the schools, manage resources, and educate our children. Full-time dad Christopher Richards, a father of three, said his decision to run for the school board came from wanting to do more than serve on PTOs and fundraise for school events. His children attend Brentwood Middle and High School. I believe the most important priority facing Williamson County is the dynamic housing growth and the strain on school capacity. I am in favor of building larger schools to handle this growth. However, increased school size may not be possible in all situations and as we face the possibility of rezoning, it will be important to have a well-functioning school board whose members can discuss alternatives cooperatively and respectfully. I decided to run for school board after speaking with many people who expressed concern that the District 7 incumbent left them feeling unrepresented. The incumbent has been a rubber stamp for the school administration, only going against two decisions in his four years on the board. One of the two, Rick Wimberly said he wanted to keep his seat, noting he had proven himself with how he acted in tense board situations and maintaining a level perspective. The Williamson County dad said in his spare time, helps with Destination Imagination, which promotes creative problem solving through an array of competitions. Denise Boothby, who was unable to attend, is the mother of two sons and has lived in Williamson County for the past 20 years. I believe education should be about motivating, inspiring and educating our students with their future in mind. We must teach our children how to set goals and to be visionaries. With the proper educational tools they will have a much better chance of accomplishing their dreams. All parents want their children to succeed and be accomplished individuals, prepared for their future. I believe my opponent is happy to boast of high graduation rates, high ACT scores and high college acceptance numbers. While these are all great accolades, they are by no means a complete measure of success. With the highest early voting participation, the District Eleven candidates have made the contest a friendly race. Both KC Haugh and Stuart Cooper both said from the beginning they wanted to have a clean race for the school board and have. The two have similarities – they are both dads and expressed passion for wanting to be an advocate for parents. But the two have had differing endorsements from PACs and partisan politics. So far, 1,086 residents have cast a ballot, totaling 10.7 percent of the 10,058 registered. Stuart Cooper, who has been a self-proclaimed Republican, said his message has remained with unity in education. He explained he had knocked on more than 1,500 doors and had hundreds of conversations with residents to give insight on what might be needed from someone in that position. He noted he had several questions about a potential consolidation of the Franklin Special School District and Williamson County Schools, but held no position either way. His opponent KC Haugh said he ran for the school board after he watched the rezoning talks five years ago and the tone of the current board. “I am somebody who went from saying, ‘I’ll never run for school board,’ and realizing it was something I had to do,” he said. Haugh said he would make efforts to keep politics off the school board. He also said he took no issue with Looney, and would aim to work with him, though not being a “rubber stamp” for every one of his ideas.